For the first time the Venice Biennale has dedicated a special section to dance: a review directed by Carolyn Carlson, which was performed at the Teatro Goldoni from 28 September until 30 October 1999. The review was entitled "Solo donna" ("Only Woman") and performers from around the world were invited. All the performers were women except for Kazuo Ohno, the 93-year old master of Butoh who presented an anthology of his most celebrated female creations, as always en travesti, on the 1st and 2nd of October. The show included The Divine, from Admiring La Argentina ('77): in 1929 a physical education instructor meets the flamenco dancer Antonio Merce and is completely enchanted, so much so that he decides to dedicate himself to dance. This homage to the great flamenco dancer carries us into an atmosphere created by significant gestures, a dance born of interiority, expressing the deepest sentiments: love, tenderness and pain. words of sweetness and serenity, in which life's happy moments are remembered and there is no fear of beginning a new voyage to the unknown, a sort of last will in the form of a poem. The faint and halting voice, imperceptible but expressive, seizes us, moves us, and even we the spectators feel like her children. The only feminine note: a colored head-dress. An improvisation leads us into a typically Japanese atmosphere with the classic low red table and a geisha who dances around it. To the strains of a Viennese Strauss waltz, Vienna Waltz and Ghosts, from The Dead Sea ('85), leads us into a kind of sonorous reverie rich in suggestive moments, some pleasant and others profoundly sad. In The Dead Sea ('85) Kazuo improvises while his son Yoshito Ohno (with choreography by Tatsumi Hijikata) presents one of his very suggestive solos, full of tension, performed with minimal yet essential gestures. These two figures on stage made us feel and see two different ways of conceiving "the dead body" typical of Butoh´s dancing. And it is with the dead body that one must begin in order to elicit the freest emotion possible, that emotion that is able to break all the rules imposed on a living body and which, for Ohno, only the soul is able to maneuver. At the end of the show Michelangelo Antonioni gave Kazuo Ohno the "Michelangelo Antonioni Prize for the Arts" for 1999, sponsored by the Kyblion Cultural Association, in collaboration with the Venice Biennale, whose Director Paolo Baratta was present, along with the Mayor of Trevi. This was the first granting of this international prize, which is to be given to an artist whose work has influenced the direction of art. On 30 September at 11.00 o´clock, in the Teatro Goldoni, a discussion between Michelangelo Antonioni and Kazuo Ohno was held in the presence of students, teachers, journalists, and others in the field. After an introduction, which included the reading of passages from the work of Kazuo Ohno and an informational note on Butoh dance, the "Michelangelo Antonioni Prize for the Arts" was presented. Some questions were asked. I knew it was pointless to expect direct answers because Kazuo Ohno speaks in metaphor. You are considered the founder of Butoh. What do you think has changed in this dance since its origins up until today? What has remained unchanged ? I thank you for coming to Venice and I am moved by this friendly reception, finding myself here with Antonioni -- his teachings were important -- and hearing and seeing so many people. My heart soars and I am eternally appreciative. I spent two years in New Guinea and seven in China and when the war ended and it was time to return to Japan, there was the state of happiness, the joy of return, but the sufferings and the pain of the soldiers and of the persons who, during the voyage of reentry to the fatherland, died and were taken into the sea. They so struck me then that I thought back on all those vanished people and created the Dance of the Medusa. I wanted, with this dance, to express the pain of relatives over the disappearance of their dear ones, who in fact died -- there is the pain -- but who at the same time are alive, there being something that continues, death not being an end but a beginning. I cannot find the words for this, but when death is spoken of it has a negative image, whereas for me life and death are both part of man: and life and death, this alternation, are the beginning of something, not the end. This prompted me to say: the relation between life and death. 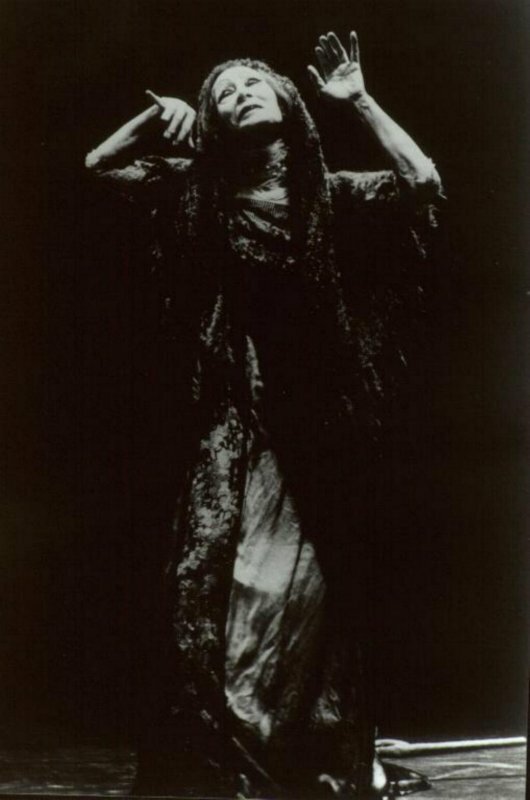 In practicing my dance I do not address the problem of Butoh today, but that of man´s relationship with life and death, this is the fundamental theme of my dance. The second question: What do you think that Butoh can tell or teach future generations and what is the message of Butoh ? Answer: The recovery of emotional memory, of the roots, this is surely the legacy for future generations, but the phrase occurs to me, "in the corolla of a flower is the universe," this is the teaching offered us by Antonioni, on which all of us are called to reflect; in this "blooming" of something and in the rapport between life and death the universe is disclosed. This last phrase is said with such emotion that it moves him and all of us. Leaving, I am so profoundly moved and shaken that, not by accident, there occur to me certain of his words read earlier: « only when you are able to break the conventions that society has imposed on your body and mind, only when you have abandoned individuality and rigid thinking, only then will you be finally free to let flow out the pure expression of your soul. You are happy because you are free. Smile and a flower blooms in your mouth ». Words profoundly touching, and in whose simplicity we rediscover the essence of life. How did you become familiar with Butoh dance and how does a westerner come to be a part of it and understand it ? I became familiar with Butoh dance after watching a performance by Kazuo Ohno in 1984 in Rovereto. The show was L´Argentina, and it goes without saying that I was amazed -- much more than that, it it got inside me, because in the following years I searched in every way to practice this dance. It was not easy because there were no conservatories or schools in Italy. In 1991 I participated in a workshop, at the festival of dance and mime in Perigueux (France) with the master Masaki Iwana. Then I continued frequenting other workshops in Paris, Rome, and Normandy. At times I didn´t understand what I was doing or where I was going, because I am a westerner and it was difficult for me to accept a course in which I couldn´t foresee the next goal. I think that the most difficult thing is to forget being a westerner, dominated by the head, by the brain, by the intellectual sphere. For the first three years it is possible not to understand anything you´re doing, this is what Kazuo Ohno tells his students: you must accept, then you must begin little by little to feel. There are also people who stop earlier because there are various kinds of tests to pass. What about the different schools of Butoh and their popularity ? Each school is identified with its master, therefore they are very subjective and diverse. 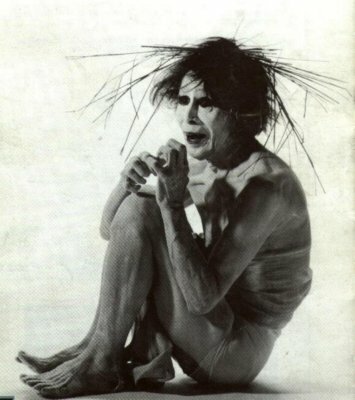 My master Masaki Iwana uses a very rigorous technique, even though Butoh is a dance of improvisation, in which there are no recognizable forms, as in modern dance. Which however does not mean that anything at all may be improvised; everything passes through the rigor of the body. On the other hand I know that other Butoh masters have no technical skills. Mine consists in a precise bodily training, achieved by various ways of walking, stretching exercises, yoga, and specific exercises for balance, strength, and flexibility -- the body should have stored up well these three fundamental points. Butoh is the dance of the soul, of immanence, and of deep existence, and if the body fails to translate it, it remains incomplete. The fact that Butoh is not more popular and has not become a consumer phenomenon is a measure of its power and great intensity: it is so powerful than it cannot be quickly consumed. 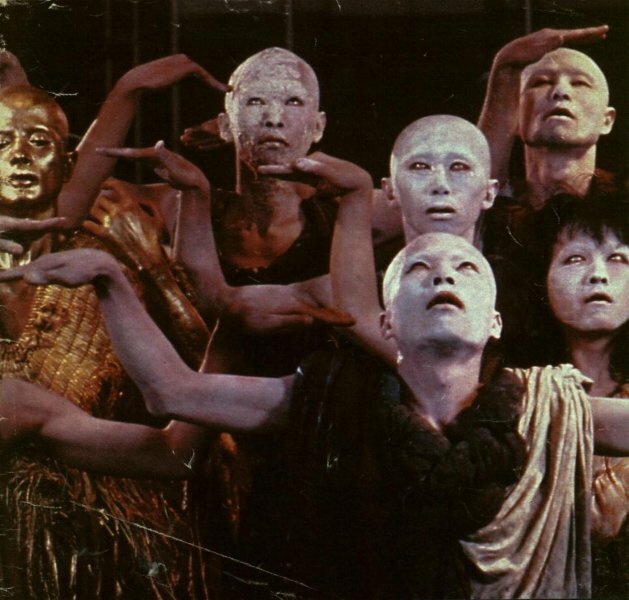 Butoh makes its appearance in the West with the groups Dai Rakuda Kan, Tensi Kan, Shankai Juku, and Ariadone in the 1980s at the theater festival in Nancy. 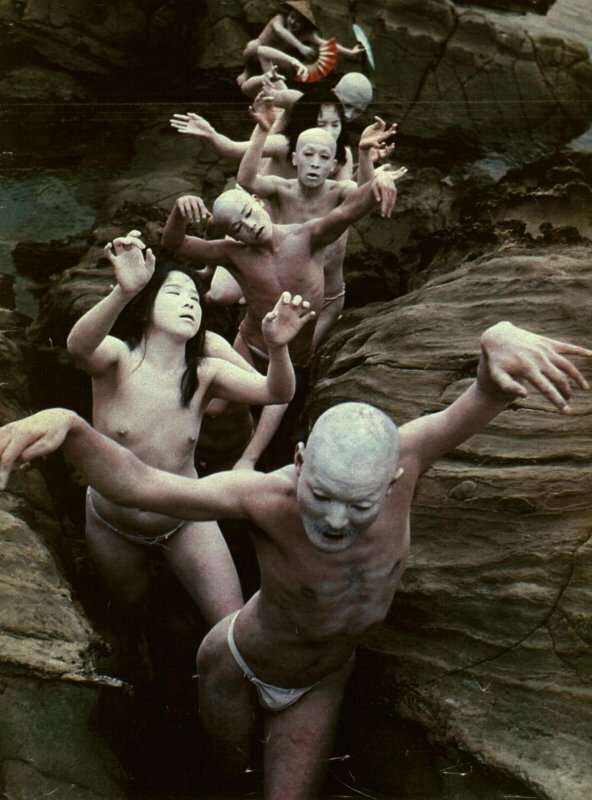 Also there are Kazuo Ohno and Tatsumi Hijikata, universally regarded as the founders of Butoh dance. Kazuo Ohno, unlike the others, always appears in women´s clothing, wearing flowers, hats and garish makeup. His self-presentation is poetic without excess, perhaps dictated by his conversion to Christianity. 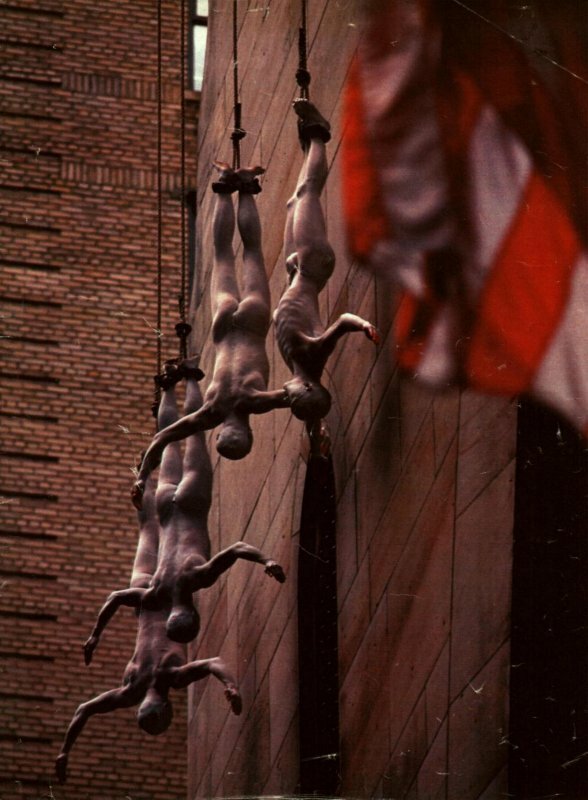 Every company works in a different way, but the premises are fundamentally the same: to seek, express, and investigate the relationship between body and expression; to reject conventional techniques; to discover how interiority can speak through the body, and express itself only by and with the body -- these are the premises of a dance born in the 1950s. The Ankoku Butoh, the dance of darkness, is a veritable manifesto against the horrors marked on the body by the atomic bomb, against the American oppression that threatened the authenticity of Japanese culture, and not by accident was it born in Japan, in the work of those who felt how the body can externalize better than words all that it has suffered. It is also the search for the origin of the universe, of man, of life and of that tenuous link between life and death. A dance performed with gestures at times imperceptible, minimal, suppressed, suspended in air, hands and fingers contracted, turned upwards as if elevated toward that spirit to which the whole body turns and gives itself. Bodies that are lithe, delicate, slightly curvaceous, covered in a blinding white, shaven heads in which sexual identity no longer exists, is no longer recognizable, supple legs, fetal and sorrowful bodies that lead us into the world of darkness, the world of our soul forever suspended between life and death. it is not a technique but a method for returning by means of the body to the origins of existence and for answering the question 'who am I?´ Each person answers this according to his own experience of everyday life, his encounters, his mode of seeing, doing, feeling." I think that all of us, one way or another, in every day of our existence, dance our own Butoh dance, if we are able to find in an encounter, in a smile, in the blooming of a flower, in a wild plant, in the gaze of a baby, all the mystery of life and death, the beauty of life.